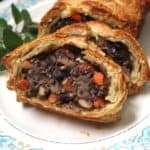 This gorgeous Vegan Wellington with Mushrooms and Lentils will have everyone gawking -- and gorging -- at your holiday table. It tastes just as good as it looks, with meaty lentils and mushrooms tied together by a mirepoix of onions, carrots and celery and infused with fresh herbs. A vegan, nut-free recipe. Place the lentils in a saucepan, cover with an inch of water, bring to a boil, cover, and continue cooking 10-15 minutes or until lentils are tender but not mushy. Drain and set aside. Heat the oil in a skillet. Add the carrots, celery, onions and garlic along with a dash of salt and ground black pepper. Saute, stirring frequently, until the veggies start to caramelize. Add the mushrooms, saute for a minute, then add the wine. Continue to cook, stirring often, until the wine has evaporated and the mushrooms are browned. Add the herbs, soy sauce or tamari, dijon mustard and salt and ground black pepper to taste. Add the lentils and continue cooking until there is no visible liquid in the skillet. Add the flour and mix well until the flour is absorbed by the mixture. Turn off the heat. Roll out one of the puff pastry sheets to 11 X 13 inches on a lightly floured surface. Divide the lentil mixture in two and place one half in the center of the puff pastry sheets, forming a loaf with your hands as you go. Press it in firmly so it holds together, then bring one side of the puff pastry sheet over the top, and then the other. Tuck in the top and bottom so you have a neat-looking, fully wrapped log. Press in the seams to seal, brush with water first to help the puff pastry stick. Repeat with the second sheet of puff pastry and the remaining lentil-veggie mixture. Place the logs on a baking sheet, at least two inches apart. Using a sharp knife, score the top of the log in a decorative pattern-- I did a crosshatch that's pretty and also pretty easy to make. Mix the two wash ingredients and brush the wash on the tops of the wellington loaves. This gives the baked loaf a lovely color. Place the baking sheet in the preheated oven and bake the wellington logs for 45 minutes. Remove, let the wellingtons stand for about 10 minutes, then slice and serve.